The distribution of wealth and income reveals inequalities among and within countries and the ways in which wealth is redistributed. The distribution of wealth compares the assets —including income, land, stocks, and other investments—held by the richest and poorest members of society, while the distribution of income compares only how much money each group earns per year. Since the 1970s, the gap in wealth between the highest and lowest brackets of earners has grown, with 2 percent of the population owning a majority of global wealth and the bottom half of the population owning less than 1 percent of global wealth in the year 2000. Policies aimed at redistributing wealth may attempt to either increase the wealth of the upper class or decrease inequality. These policies may include the adoption of national economic systems or the operation of small scale charitable organizations. income distribution: In economics, income distribution is how a nation’s total GDP is spread amongst its population. distribution of wealth: A measure of how assets are divided throughout the population. Pareto Distribution: A statistical measure that is often used to model the distribution of wealth. The distribution of wealth is a comparison of the wealth of various members or groups in a society. It differs from the income distribution in that it looks at the distribution of asset ownership in a society, rather than the current income of members of that society. There are many ways in which the distribution of wealth can be analyzed. One commonly used method is to compare the wealth of the richest ten percent with the wealth of the poorest ten percent. In many societies, the richest ten percent control more than half of the total wealth. A Pareto distribution is a statistical measure that is often used to model the distribution of wealth, though other mathematical models are also used. The Gini coefficient measures the amount of wealth or income inequality in a society by plotting the proportion of total income (or wealth) earned by the bottom x percent of the population. At the end of the 20th century, wealth was concentrated among the G8 nations (France, Italy, Germany, Japan, the United Kingdom, the United States, Canada, and Russia) and Western industrialized nations, along with several Asian and OPEC (Organization of Petroleum Exporting Countries) nations. A study by the World Institute for Development Economics Research at the United Nations reports that the richest 1 percent of adults owned 40 percent of global assets in the year 2000, and that the richest 10 percent of adults accounted for 85 percent of the world total. The bottom half of the world adult population owned 1 percent of global wealth. Moreover, another study found that the richest 2 percent of the population owned more than half of global assets as of the year 2000. In terms of distribution of income, a May 2011 report by the Organization for Economic Cooperation and Development (OECD) stated that the gap between rich and poor in OECD countries (most of which are “high income” economies) was at its highest level since the 1970s. One form of wealth is land or real estate. As with general wealth distribution, land is also distributed unequally. Sizable numbers of households own no land, while a small percentage of people at the top of the economic hierarchy own most of the world’s privately held land. For example, 10 percent of land owners in Baltimore, Maryland own 58 percent of the taxable land value. The bottom 10 percent of those who own any land own less than 1 percent of the total land value. In 2007, 147 companies controlled nearly 40 percent of the monetary value of all transnational corporations. On an international level, wealth is distributed unequally between nations, which are stratified in a world economic order. In many societies, attempts have been made to redistribute wealth through property redistribution, taxation, or regulation. Sometimes these policies are engineered to favor the upper class, while in other cases they are intended to diminish inequality between the upper and lower classes. Examples of this practice go back at least to the Roman republic in the third century B.C., when laws were passed limiting the amount of wealth or land that could be owned by any one family. Motivations for such limitations on wealth include the desire for equality of opportunity, a fear that great wealth leads to political corruption, the belief that limiting wealth will gain the political favor of a voting bloc, or fear that extreme concentration of wealth results in rebellion. Various forms of socialism, an economic system in which the state exerts significant control over wealth distribution, attempt to diminish the unequal distribution of wealth and the conflicts that arise from it. Communism, an economic system that (in its ideal form) consists of state ownership of assets and industry and the equal distribution of resources among the population, can be seen as an attempt to eradicate wealth inequality through government policy. An idea taken from Karl Marx’s Communist Manifesto is that wealth should be distributed as according to the precepts of, “From each according to his ability, to each according to his need. ” While states such as the Soviet Union and China have implemented communist systems to varying degrees, Marxism has never been realized in its ideal form, and no country has had a totally equal distribution of wealth. In addition to government efforts to redistribute wealth, the tradition of individual and organizational charity is a voluntary means of wealth transference. Many voluntary charitable organizations make concerted efforts to aid those in need by redistributing wealth and material resources. Global Distribution of Wealth by Country (2000): This pie chart shows the global distribution of wealth among countries, illustrating the point that a small number of countries hold the majority of global assets. Social mobility is the extent to which individuals can move between social positions, either in their lifetime or between generations. Compare the various types of social mobiliy, the status systems they exist in, and their status between countries and over time. Social mobility is most often discussed in terms of vertical mobility, which refers to movement between higher and lower status positions, or movement up and down the social ladder. Social mobility varies between countries and over time, with status more or less tied to social position at birth in different cultural contexts. Public policy may attempt to regulate the extent to which people are socially mobile, as when public school systems attempt to evenly distribute educational opportunities or religious bodies attempt to limit the movement of women. cultural capital: Non-financial social assets that promote social mobility beyond economic means, such as education, intellect, style of speech, dress, and even physical appearance. Social mobility refers to the movement of individuals or groups in social position over time. Most commonly, social mobility refers to the change in wealth and social status of individuals or families. However, it may also refer to changes in health status, literacy rate, education, or other variables among groups, such as classes, ethnic groups, or countries. Social mobility typically refers to vertical mobility—movement of individuals or groups up or down from one socio-economic level to another, often by changing jobs or marriage. Nonetheless, social mobility can also refer to horizontal mobility—movement from one position to another within the same social level, as when someone changes between two equally prestigious occupations. In some cases, social mobility is intergenerational, as when children attain a higher or lower status than their parents held. Other times, social mobility is intra-generational, meaning that a person changes status within their lifetime. A high level of intergenerational mobility is often considered praiseworthy, and can be seen as a sign of equality of opportunity in a society. Societies present different opportunities for mobility depending on their system of values. For example, Western capitalist countries are generally meritocratic, in which social standing is based on such personal attributes as educational attainment, income, and occupational prestige. In such countries, highly skilled jobs pay better than low-skilled jobs. This type of society has an open status system, which functions on the basis of achieved status, or status gained through one’s own merit. Thus, the degree of mobility in Western capitalist states ideally depends on the extent to which individuals have access to educational and economic opportunity, rather than their position at birth. On the other hand, closed status systems are based on ascribed status. Ascribed status is a fixed position a person is born into, not based on their performance. When this ascriptive status rule is used (for example, in Medieval Europe), people are placed in a position based on personal traits beyond their control. The ability of an individual to become wealthy out of poverty does not necessarily indicate that there is social mobility in his or her society. Some societies with low or nonexistent social mobility afford free individuals opportunities to initiate enterprise and amass wealth, but wealth fails to “buy” entry into a higher social class. In feudal Japan and Confucianist China, wealthy merchants occupied the lowest ranks in society. In pre-revolutionary France, a nobleman, however poor, was from the “second estate” of society and thus considered superior to a wealthy merchant (from the “third estate”). These examples demonstrate how social mobility is not simply based on economic capital, but also social and cultural capital. Several studies have been conducted to compare social mobility between countries. Recent data shows that of nine developed countries, the United States and United Kingdom have the lowest intergenerational vertical social mobility, with about half of the advantages of having a parent with a high income passed on to the next generation. The four developed countries with the the highest social mobility are Denmark, Norway, Finland, and Canada, with less than 20% of advantages of having a high income parent passed on to their children. Not only does social mobility vary across types of countries, it can also change over time. For example, social mobility in the United States has varied widely since the 19th century. In the United States in the mid-19th century, inequality was low and social mobility was high. In the 19th century, the U.S. had much higher social mobility than comparably developed nations like the U.K., due in part to the common school movement and open public school system, a large farming industry, and high geographic mobility. However, during the latter half of the 20th century and the early 21st century, social mobility has decreased and social inequality has grown in the U.S. In other words, in the U.S. an individual’s family background may be more predictive of social position today than it was in 1850. Mexico’s rapid economic changes have led to huge gains in GDP, but have caused social problems such as stratification and inequality. Mexico’s economy has expanded in recent years, but the benefits of economic growth have not reached all sectors of the workforce, resulting in economic stratification, a significant proportion of the population living in poverty, and high rates of underemployment. Mexico’s entry into free trade agreements has solidified its position in world market and aided its national economic growth, but has arguably failed to improve standards of living for much of it’s population. Mexico’s industrial and agricultural sectors illustrate the uneven nature of economic development, which often benefits individuals and groups who have financial capital and assets, while not significantly improving the situation of lower classes, particularly those in poverty. Developed Nations: a sovereign state which has a highly developed economy and advanced technological infrastructure in comparison to other, less developed nations. poverty: The state of one who lacks material possessions, wealth, or access to social resources and opportunities. Mexico’s economy has undergone significant changes in the past century, with implications for the country’s economic position and its population. After the Mexican Revolution (1910-1917) overturned the previous land distribution system, in which a few hacienda owners overworked and underpaid millions of peasants, the new Mexican leaders instituted a nominally socialist democracy. The years from 1930-1970, during which Mexico instituted its new protectionist economic policy, have been dubbed by economic historians as the “Mexican Miracle,” a period of economic growth and capital accumulation. While population doubled from 1940 to 1970, gross domestic product (GDP), the sum of national production and a common measure of economic growth, increased sixfold during the same period. After the international oil and interest rate crisis in 1982, which had a profoundly negative impact on the Mexican economy, Mexican leaders changed economic directions. They instituted neoliberal reforms which increasingly integrated Mexico’s economy with that of other nations. Trade liberalization continued after that, with several free trade agreements with Latin American and European countries, Japan, and Israel signed during former President Vincente Fox’s leadership (2000-2006). Thus, Mexico became one of the most open countries in the world to trade, and the economic base shifted accordingly to exports and imports. Map of Mexican Free Trade Agreements: Since liberalizing its trade policies beginning in the 1980s, Mexico has entered into Free Trade Agreements with many countries. This trend has greatly increased the amount of Mexico’s economy that depends on imports and exports. Mexico’s economic development has been substantial. However, general GDP growth obscures some pervasive problems that have persisted and even worsened in recent years, including social stratification, poverty, and unemployment. Social stratification, or the grouping of individuals into a hierarchy based on socioeconomic status, is highly present in Mexico and can be traced back to the colonial period. During the colonial period, before Mexico’s independence, the upper class was composed of those who owned the land and the lower class was made of those who worked the land. After the Mexican Revolution, the government ceded an estimated 50% of the land to the general population. Though this slightly reduced the gap between the wealthy and the poor, land ownership continued to be main source of wealth for Mexicans and has dictated the hierarchy of wealth distribution among the population. After the country entered its economic industrial transformation, industrialists, businessmen, and politicians have controlled the direction of wealth in Mexico and have remained among the wealthy. The monopoly that the wealthy have over resources in Mexico is evidenced in OECD statistics: Mexico is the country with the second highest degree of economic disparity between the extremely poor and extremely rich, after Chile, although this gap has been diminishing over the last decade. The bottom 10% of income earners possess 1.36% of the country’s assets, whereas the upper 10% possesses almost 36%. 85% of national wealth is concentrated in a few families of entrepreneurs, corporate magnates, and politicians. Thus, economic industrialization has not necessarily led to an improved standard of living for a significant portion of the Mexican population, many of whom live in poverty. The gap between the rich and poor has not only remained large between classes, but also has been growing between northern and southern regions. As reforms have taken place, the southern states, such as Chiapas, Oaxaca, and Guerrero, have remained isolated from the rest of the country. The national government provides less funding to these southern regions than to northern regions. Consequently, infrastructure, social development, education, and economic growth have lagged behind in southern states. These states hold the highest levels of illiteracy, unemployment, lack of basic services such as running water and sanitation, overall urban infrastructure, and government stability. Poverty in Mexico is characterized as lack of access to basic human needs such as nutrition, clean water, and shelter. Poverty can also include lack of access to extends to social services such as education, healthcare, security, and income. Current figures indicate that as much as 44.2% of Mexico’s population lives below the poverty line as defined by the country’s National Council of Social Development Policy Evaluation. While causes of poverty are multiple, many social scientists have posited that the government’s emphasis on national economic growth has neglected the needs of the country’s poorer citizens. For example, Mexico’s heavy dependency on foreign influences, particularly the United States, has led it to adopt policies that do not favor its own citizens. Similarly, many critics claim that while the NAFTA agreement proved effective in increasing Mexico’s economic performance, foreign trade policies have not done enough to promote social advancement and reduce poverty. To remain competitive in the international market, Mexico has had to offer low wages to its workers while allowing high returns and generous concessions to international corporations. Nonetheless, the government’s current administration has made attempts to reduce poverty by providing improved education, healthcare, and job opportunities to citizens. In recent years, a middle class, once virtually nonexistent, has begun to emerge. Mexican society still shows traces of the racial and ethnic caste system that was instituted by the Spanish during the colonial period. With regards to Mexican population groups, processes of identity formation and social stratification can be analyzed both in terms of race and of ethnicity. This is because definitions of each depend upon biological and socio-cultural traits. The large majority of Mexicans can be classified as “mestizos,” meaning that they neither identify fully with any indigenous culture nor with a European heritage. Rather, they identify as having cultural traits and heritage that combine elements from indigenous and European traditions. Mexican officials intentionally spread a racial ideology, known as mestizaje, that encouraged miscegenation between European and indigenous people. This was intended to distribute European descent throughout the population and create a new mestizo national identity. Generally speaking, Mexican ethnic and racial relations can be arranged on an axis between two extremes, European and Native American heritage. This division is a remnant of the colonial Spanish caste system, which categorized individuals according to their perceived level of biological mixture between these two groups. Along this axis, a color hierarchy emerged that persists in importance today. In this hierarchy, those who are viewed as being more European, or “white,” are generally endowed with higher social status. Those who are viewed as being more “indigenous,” or “dark,” are typically given less social prestige. The color hierarchy is utilized for more than simply classifying people based on their phenotypical traits, or physical appearance. It is also a way to racialize socio-cultural traits. For example, because upward social mobility is generally correlated with “whitening,” if persons with indigenous biological and cultural roots rise to positions of power and prestige, they tend to be viewed as more “white” than if they belonged to a lower social class. The racial hierarchy is complicated by the presence of considerable numbers of people with partly African and Asian heritage. Nonetheless, these groups are often categorized on the color hierarchy somewhere between indigenous and European. As a classifier, indigenous identity was constructed by the dominant European and Mestizo majority and imposed upon indigenous people as a pejorative. This identity was associated with a lack of assimilation into modern Mexico. This identity therefore became socially stigmatizing, and contrary to social expectations and ideals. In early post-revolutionary Mexico, cultural policies were paternalistic towards indigenous people, and contained efforts to completely assimilate indigenous peoples into Mestizo culture. The category of “indigena” (indigenous) can be defined according to linguistic criteria as people who speak one of Mexico’s 62 indigenous languages. This categorization method is used by the National Mexican Institute of Statistics. Conversely, indigenous identity can also be defined broadly to include all persons who self-identify as having an indigenous cultural background, whether or not they speak an indigenous language. Mexicans of European descent, often called “blancos” (“whites”) or “güeros” in Mexican Spanish, have light skin and predominantly European features. These people are typically associated with Mexico’s upper and middle socioeconomic classes. Because “Mestizos” are also people with varying amounts of European ancestry, the differentiation between “mestizos” and “blancos” is often based on socio-cultural rather than biological boundaries. Today, most blancos are still associated with the Spanish colonial order. Although some would not be considered “white” by U.S. or European standards, one way blancos distinguish themselves is by keeping separate from the Mestizo and other classes in Mexico. In popular conception, blancos are closely associated with ideas of modernity, which supposedly means that they are the closest culturally to Americans and Europeans (both are idealized as white). The large majority of Mexicans are classified as “mestizos,” meaning that they neither identify fully with any indigenous culture nor with a particular non-Mexican heritage. Instead, they identify as having cultural traits and heritage that combine elements from indigenous and European traditions. By the deliberate efforts of post-revolutionary governments, the “mestizo identity” was constructed as the basis of the modern Mexican national identity, through a process of cultural synthesis referred to as mestizaje. The term “mestizo” is not widely used in Mexican society today, and it has been dropped as a category in population censuses. That being said, it is still used in social and cultural studies when referring to the non-indigenous part of the Mexican population. The word has somewhat pejorative colloquial connotations. Most people who would be defined as mestizos in the sociological literature would probably self-identify simply as Mexicans. In addition, people will self-identify as “gente de razón” (“people of reason”), in contrast to “gente de costumbre” (“people of tradition”), thus further differentiating themselves from the status of indigeneity, which is considered superstitious and backward. In the Mexican post-revolutionary period, mestizaje was a racial ideology that combined ideologies of white superiority with the social reality of a postcolonial, multiracial setting. It promoted the use of planned miscegenation (the mixing of racial groups through reproduction) as a eugenic strategy to improve the overall quality of the population. In the logic of “mestizaje,” the distribution of white genetic material throughout the population would improve citizens. Map of Indigenous Languages in Mexico: This map shows the regions where there are over 100,000 speakers of particular indigenous languages. These areas are concentrated in the poorer southern states. Thus, the areas that have not been heavily economically modernized have not been as significantly affected by ethnic mestizaje. 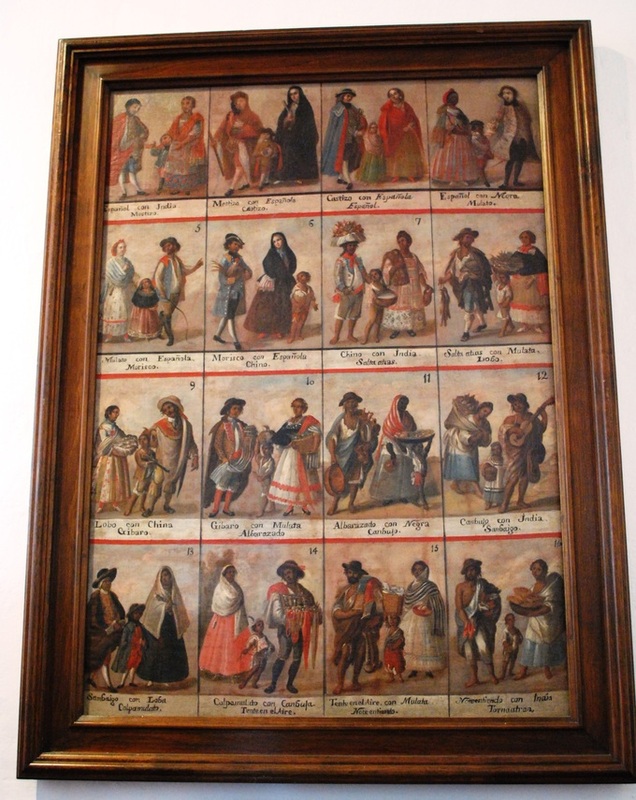 Spanish Caste System in Mexico: This artist’s rendering of the Spanish racial/ethnic caste system imposed in Mexico during the colonial period illustrates the hierarchy from white Europeans to dark-skinned Native Americans or indigenous people. In spite of purported economic growth, both women and men in Mexico have to deal with social stratification, poverty, and unemployment. Mexico’s primary, secondary, and tertiary economic sectors have all expanded in recent years, but the benefits of economic growth have not reached all sectors of the workforce, resulting in economic stratification. Mexico’s entry into free trade agreements (like NAFTA) has solidified its position in the world market and has aided its national economic growth, but has arguably failed to improve standards of living for much of its population. As a result of these changes, between 1940 to 1970, the population of Mexico doubled, and the gross domestic product (GDP), the sum of national production and a common measure of economic growth, increased sixfold. Social stratification, or the grouping of individuals into a hierarchy based on socioeconomic status, is highly present in Mexico and can be traced back to the colonial period. During the colonial period, before Mexico’s independence, the upper class was composed of those who owned land, and the lower class was composed of those who worked the land. After the Mexican Revolution, the government ceded an estimated 50% of the land to the general population. Though this slightly reduced the gap between the wealthy and the poor, land ownership continued to be a main source of wealth for Mexicans, and it dictated the hierarchy of wealth distribution amongst the population. The gap between the rich and poor has not only remained large between classes, but also has been growing between northern and southern regions. As reforms have taken place, the southern states, such as Chiapas, Oaxaca, and Guerrero, have remained isolated from the rest of the country. The national government provides less funding to these southern regions than to northern regions. Consequently, infrastructure, social development, education, and economic growth have lagged behind in southern states. These states have the highest levels of illiteracy and unemployment, and the lowest levels of urban infrastructure, government stability, and basic services, like running water and sanitation. Poverty in Mexico is characterized as a lack of access to basic human needs, such as nutrition, clean water, and shelter. Poverty can also include a lack of access to social services such as education, healthcare, security, and income. Current statistics indicate that as much as 44.2% of Mexico’s population lives below the poverty line, as defined by the country’s National Council of Social Development Policy Evaluation. In 2008, 33.7% of the population lived in moderate poverty, and at least 10.5% suffered from extreme poverty. While the causes of poverty are multiple, many social scientists have posited that the government’s emphasis on national economic growth has neglected the needs of the country’s poorer citizens. For example, Mexico’s heavy dependency on foreign influences, particularly the United States, has led it to adopt policies that do not favor its own citizens. Similarly, many critics claim that while the NAFTA agreement proved effective in increasing Mexico’s economic performance, foreign trade policies have not done enough to promote social advancement and reduce poverty. To remain competitive in the international market, Mexico has had to offer low wages to its workers, while at the same time allowing high returns and generous concessions to international corporations. Unemployment, or the rate of potential members of the labor force who are unable to find or maintain employment, has been at continuously high levels in Mexico. In spite of splendid macroeconomic indicators, low levels of inflation, and stable currency, job creation has not kept pace with a growing population and labor pool. Underemployment refers to an employment situation that is insufficient in some important way for the worker, such as holding a part-time job despite desiring full-time work, or being over-qualified for a position. Over-qualification occurs when an employee has education, experience, or skills beyond the requirements of the job. In Mexico, underemployment results largely from over-qualification. There are few high paying jobs available for university graduates. Often, college graduates search for years to find a job that is suitable for their qualifications, while working low-paying jobs that do not utilize their skills in the meantime. Situations like this have caused the standard of living among the urban middle class to deteriorate and has also resulted in emigration from this sector to other countries, especially the United States and Canada. The situation also depicts how Mexico’s economy has failed to provide the structural opportunities for social mobility that industrialization and economic development purportedly promise. 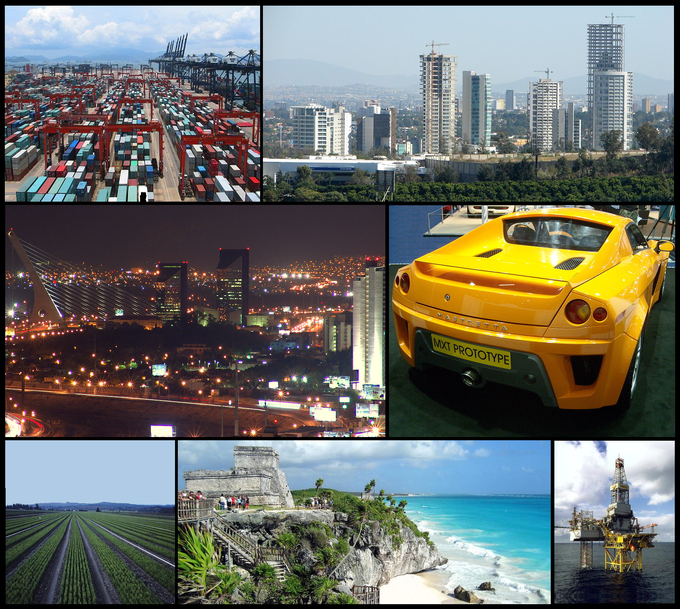 Mexican Economic Growth: In recent decades, the Mexican economy has experienced growth in its primary sector (including agriculture and oil extraction), secondary sector (auto manufacturing), and tertiary sector (including tourism).